The Finland Ice Breakers played a 9-a-side friendly against Sweden last weekend, and although the Finns went down 151-55, the game created a fair amount of interest in the western town of Halikko (population 9,491) and drew a crowd of around 150 enthusiastic locals. The game also featured the first time a 100% Finnish team has taken the pitch in the Ice Breakers jumper, albeit only for the first quarter, with over 30 Finnish players now on the lists of the two Finnish footy clubs so far. World Footy News spoke with Finland AFL president Izzy Barker about the game and plans for Finnish footy, including next year's Finnish domestic league and the International Cup. The Finland AFL now has two clubs on the pitch, the Helsinki Heatseekers and Halikko-Salo. According to Barker, "We have been strongly building over the past months, Halikko/Salo being the big progress story. We now have 30+ plus Finns in the area hooked on AFL. The crowd at the weekend's game really were involved and cheered every mark and loved the tackling. We blooded many new guys with an aim to expose them to a quality footy. They must have a bench mark of how hard they must work to play in the International Cup, which I believe we will attend. Our Halikko/Salo players have started own saving campaign to come to the IC. I hear the players' girlfriends comfirming their men have consent. Footy is becoming contagious here, every person it is touching has become hooked. In the last week we have had one national full page newspaper article and two localised full page articles, coverage on two radio stations and an invite to a national T.V program to promote AFL. Our Sweden match came ahead of a Kimmi Raikonen story in Salo on Sunday! The planned match against the Convicts' London branch has recently fallen through, but there is a possibility of a squad from the BARFL making it to Helsinki for a match this weekend. "We should have confirmation today regarding Adam Bennett bringing a BARFL team to play us at short notice. If they are unable then we will play another domestic game, the guys can not get enough and have arranged the holidays to play rain, hail or shine." Regarding new clubs, Helsinki is currently benefiting from the national paper coverage last week with five new Finnish players contacting the league. Says Barker "We have a strong foundation in Halikko/Salo with Kimmo Heikkila and Jani Saarinen putting a huge effort in attracting mates and everyone they meet. Their effort is the reason the Sweden game was hosted in Halikko. Also as the area is close to Turku and Tampere, we see most benefit currently working in close to these areas. "The benefits were obvious after our game on Saturday, it appeared the entire area of Halikko/Salo knew of the event, the word is spreading rapidly of this fast paced, physical, action packed sport. I have been attending a few training sessions in their area to monitor progress, enthusiasm and training methods. A tick in every box. We have a Aussie guy in both Tampere and Turku and now will put some pressure in the towns in the form of posters and leaflets." "Our immediate plan is to get Finns coaching, umpiring and running the show. Providing them with the tools and model to attract new areas. We are putting them in the hot seat to gain experience and it looks great." "We are talking about a domestic league starting next year and invite teams from not too distant areas at this stage, but won't deny any one. Hopefully we'll have a team in Helsinki, Espoo and in each of Halikko and Salo. Split, divide and conquer. Let's hope we attract attention now in Turku and Tampere. We are talking about a game in Tampere if time permits this season. "We are looking at forming an affiliation with the AFL at the end of the season. We have requested their help to find an AFL club for a daughter club, we are nowhere in this case right now! The AFL have assited us with plenty AFL apparel and coaching manuals. "The Sweden game showed many positives, despite the score board... Our players are now in a position of having to fight for a national jumper. Finland had 25 Finns, 3 Aussies, 2 Irish and 1 Columbian on the bench. Plus many other Finns who had other commitments on the day. The event was a great success! 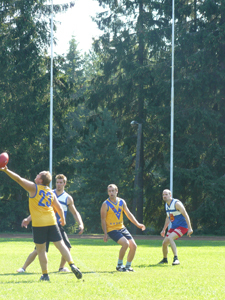 Aussie rules returned to Finland, this time in Hallikko, to host an international friendly between Finland and Sweden. Both teams are preparing for the EU Cup and the match was expected to be a close contest. Set up for the game was good; the sun was shining and some 150+ spectators filled the stadium. Unfortunately good support from home crowd wasn’t enough for Finland this time. Sweden came into the game a lot more prepared and ready, despite the fact that they had spent the previous night on the ferry. The Finnish team for the first time in history was able to field a team made up entirely of Finnish nationals in the first quarter. However that quarter will go down as the darkest moment in the short history of Finnish footy. The Swedes were everywhere, controlling all the centre clearances and in just under 20 minutes had secured a comfortable 52 point lead. However in the second quarter Finland got their act together and started to make some strong marks, and good runs. Finland won the second quarter 29 - 10 but the fight for victory was lost beyond retrieval. The third quarter offered some good quality footy. Finland finally played up to their skill level and truly challenged Sweden. Few inspirational goals from Finland got the crowd to cheer for their heroes. However, despite the good efforts, the Swedish team was still able to over come the Finns to win the quarter. 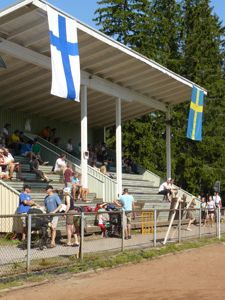 In the final quarter the Swedes started to wear out, but Finland was unable to take advantage of it. Although coming into the game with big squad Finland never got the substitutions to work in their favour and eventually they slowed paced and never challenged Sweden in the final term who powered on to another big scoring term. Although the final score was clearly a disappointment for the Finns, the match on the other hand offered some valuable experience for new players, most with a maximum 2 months experience, and was an important landmark in Finnish football. 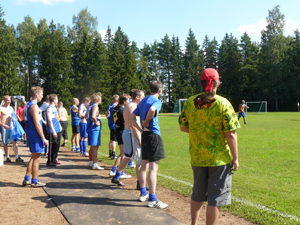 Most of the team Finland players had their first taste of international footy. Finland now faces a task to get their game together in the following weeks. The chance for payback comes on the 25th of August in Stockholm. Final score: Sweden 21.25.151 d Finland 7.13.55. Full details available at The Footy Record.